The 2012 Go The Pink Dog! campaign started in a relatively circumspect manner on the race track, with a pink dog not winning until the 43rd race of the month. Although the pink dog was quiet on the track, GRV Ambassador Jonathan Brown was busy on the airwaves making sure the message about the campaign was loud and clear. Fully utilising the opportunity to talk of his love of greyhounds. After the drought breaking win by Rough House the pink dog had a mini-resurgence, rallying to reach $5,000 by the end of the first week. Sunday proved to be the highlight of the campaign to date, with eight winners across the day, including four at Healesville. The crowd at Healesville were right behind the pink dog and with a rally from Sandown and contributions from Tasmania the total raised moved beyond $10,000. 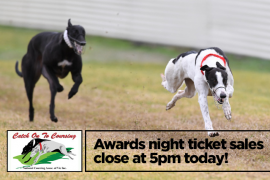 The $10,000 milestone was attained at Ballarat, when a greyhound by the name of Hotlips Cutie won at the amazing odds of $52.60, with the track proving a beacon for milestones.